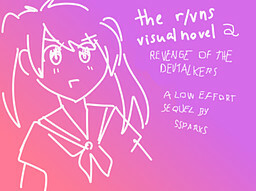 After the first edition's success, here comes the next (although unofficial) entry in the Our VNs series: Revenge of the Devtalkers. Honestly don't expect this to be good. ""Oh, so Sakura's already awake." Then she should be in the kitchen."